Hand held computer games first appeared in the late 1970s. 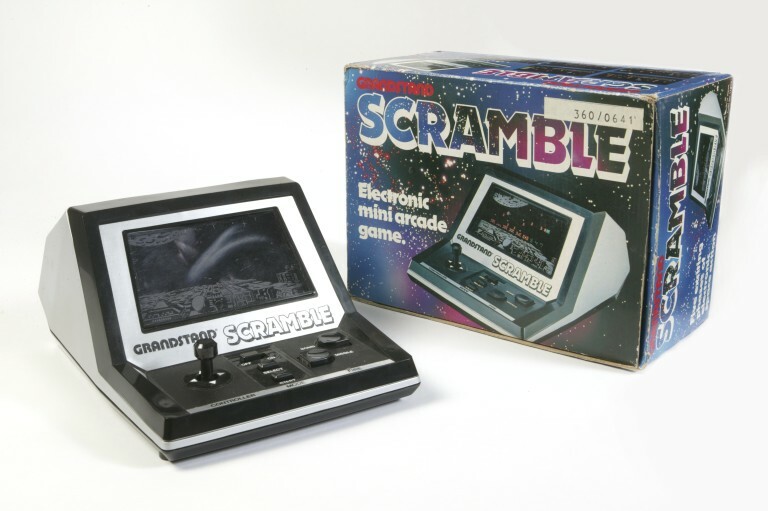 There were many new companies up and coming at this time developing games and computer consoles for the home entertainment market. These early examples are big and awkward to play compared to the ergonomic ones that are on the market today. But there is a big market for retro games. Boxed black and silver plastic hand held computer game. It has a screen at the front with a black and white space picture behind it. The control panel exists of a joystick, a on/off switch, a select, start, bomb and missile button. The screen is surrounded by aluminium with the words Grandstand and Scramble. 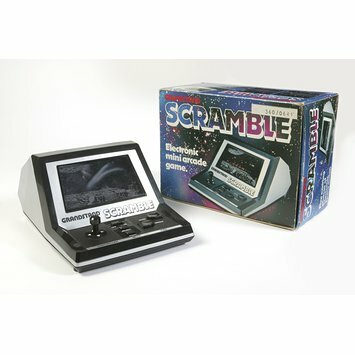 Black and silver plastic hand held computer game, Scramble, made in Japan by Epoch Co Ltd for Grandstand in 1982.